The Speedglas™ 9002NC auto-darkening welding helmet combines the classic Speedglas 9000 helmet shell with natural color lens technology. 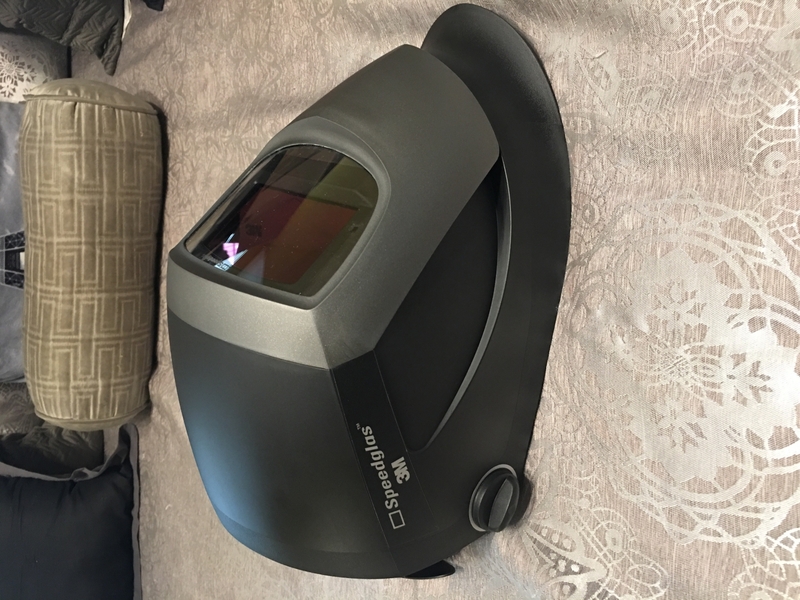 The result is an affordable, state-of-the-art welding helmet that is appealing to both the professional and occasional welder. 9002NC lens technology means a more "true" color view of the welding environment while the lens is in light state or grind mode. The dark state view of the weld puddle and surrounding weldment is crisp and clear. The 9002NC lens offers a 9.14 square inch viewing area PLUS these great features: A grinding/light state shade 3. 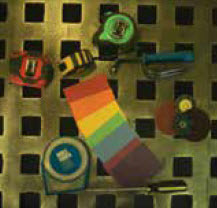 Micro-plasma welding shade 8. Arc welding shades 9 through 12. Delay and sensitivity controls are also standard. The 9000 style welding helmet shell is lightweight (17.1 ounces) and its narrow profile allows the welder to fit in tight spaces. The 9002NC shell also comes standard with built-in exhaust vents that help prevent fogging under the hood. Suspension features a smooth ratchet for easy tightening - even while wearing gloves! Package of 10 - Standard Outside Protection Plate. Suitable for Utility and all 9000 or 9002 series Speedglas™ welding helmets. Package of 5 - Speedglas™ High Temperature Outside Protection Plate for Utility, 9000 or 9002 series welding helmet. Package of 5 - Genuine Speedglas™ +1 Shade Inside Protection Plate for 90002NC, 9002X and 9000X series Speedglas™ welding helmets. Package of 5 - Genuine Speedglas™ +2 Shade Inside Protection Plate for 90002NC, 9002X and 9000X series Speedglas™ welding helmets. Can you tell me if the filter lense assembly on the 9002NC is the same unit that came with the model 9000x from years ago, and are they interchangable. 3M advises that the 9002nc lens and the 9000x lens are in fact interchangeable. Is this a good speedglas for tig welding? Speedglas 9002NC Welding Helmet 04-0100-20NC is not recommended for DC TIG welding below 20 amps. Above 20 amps the helmet will operate properly. The Speedglas 9002NC Welding Helmet 04-0100-20NC will switch automatically into a grinding/light state shade 3 when an arc is not detected. Does this hood have an auto on feature? Or do you have to turn it on with the power button? 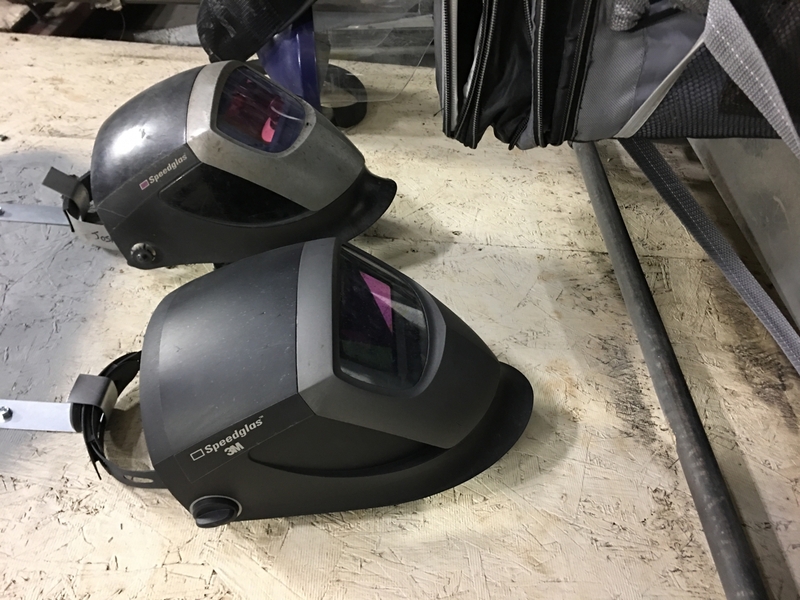 The Speedglas 9002NC Welding helmet must be turned on with the power button located on the inside of the lens- Auto-off - lens powers down after 60 minutes of last detected arc. How long is the warranty on this helmet? The warranty period on the welding helmet is the Speedglas standard 3 years on the ADF Lens and 90 days on the shell, headgear, etc. How many arc sensors? Is there solar assist? What does it take for batteries? Where can I purchase batteries? From the description and you previous answer I still can't understand where the mag lens holder is. The Speedlgas 9002NC Welding Helmet has two arc sensors. The helmet does not have solar assist, it runs on batteries only. The batteries can be purchased on our website at : http://store.cyberweld.com/speedrepbat1.html There is no magnification lens holder as the mag lens can just be placed in between the auto darkening lens and the front panel. Does this helmet work with low power d c tig welding? 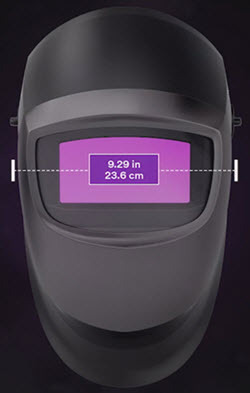 Speedglas advises that this helmet will be able to handle low amperage DC TIG welding as long as their is a clear view of the arc (no obstruction) and you are not surrounded by a large amount of additional UV light. The Speedglas rep advised that he has personally welded at 10 Amps with no problem. If you are looking to weld below 10 Amps, we would suggest the 9100 Series Welding Helmets. 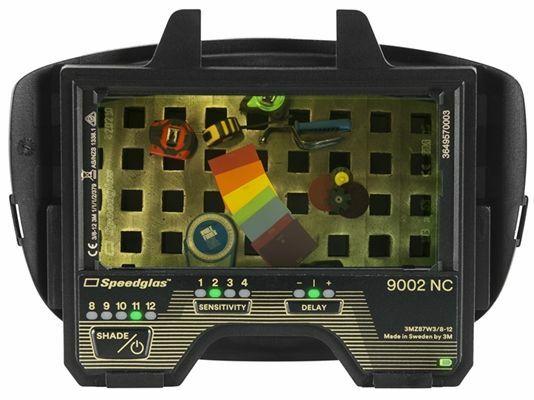 The Speedglas 9002NC has two arc sensors. How many sensors does the 9002NC have? 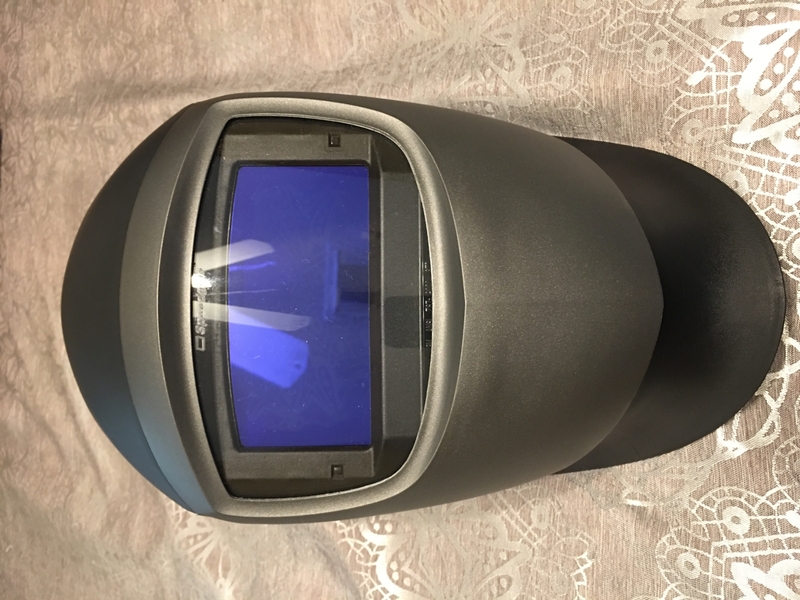 The Speedglas 9002NC comes with the 3M headgear (part number 05-0650-00). Does it come with a grind mode? And what head gear does it come with. 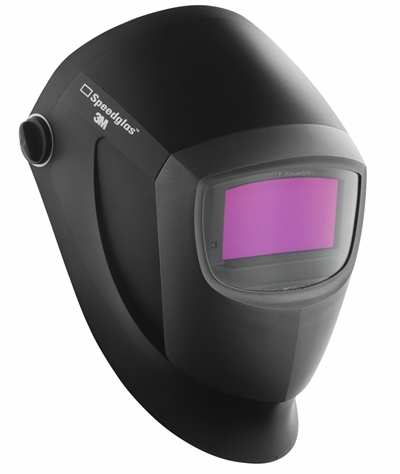 The Speedglas 9002NC does have grind mode and the headgear is 3M part number 05-0650-00. Does this helmet have a cut mode? The Speedglas 9002NC Welding Helmet 04-0100-20NC does not have a cut mode. If you wish to cut with this helmet, you can purchase a +1 or +2 lens. Once installed on the helmet, you can cut at a level 4 or 5. You can find these items under the accessories tab on the website. Can this helmet take a Mag Lens? 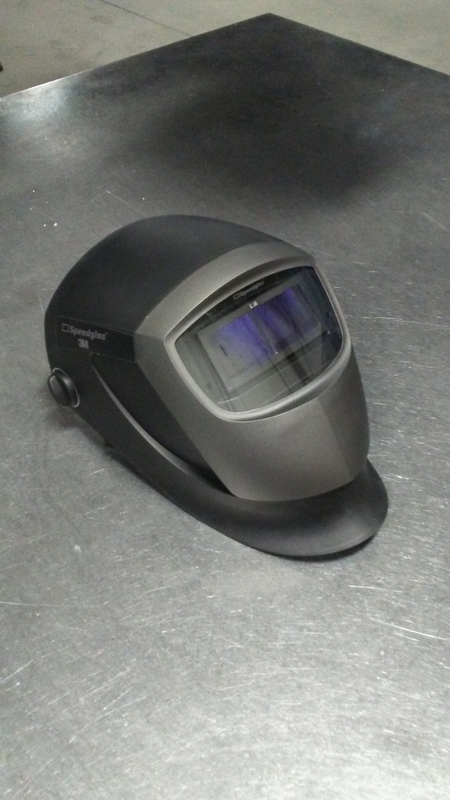 The Speedglas 9002NC Welding Helmet 04-0100-20NC does not have a mag lens slide on the inside of the helmet. Although, you can put a mag lens on the outside of the ADF Lens. 1. You cannot tell if the hood is on or off unless you press the ON button, I have flashed myself countless times. 2. Sensors are half the quality of the previous speedglas hoods, flashes on and off while tig welding. Clear view and headgear is versatile. The lens provides better clarity than the 9002X, but the battery life is shorter, due to the lack of a "solar" panel. The new style headgear is comfortable, but is weaker and requires more tension to keep the hood up. I Just bought this helmet through work. I just bought this helmet through work. Really liking it. For Mig and Tig! ProsGood clarity. Viewing color is good. Love these helmets. Vent in the front lower. Helps with breathing and not fogging up! For a single headband works well.I like the extended area around the adjustment knob. Improved adjustment knobs on sides of helmet also! I like the face shield color change from silver to a charcoal grey. Good price. Let a coworker to try while Tig welding. He really likes it. He is probably going to buy one now. ConsSingle head band, no extras. No extra lens, no carry bag. No auto on. As you start welding. No inner magnification lens holder. place the magnification lens between front lens and outer lens. I was a bit skeptical at first then bought it and I love it. Great hood. Clearer and brighter lens quality. Mostly interchangeable with my old 9002x. Probably the best and lightest hood out there for the money. Regularly get 7 years out of this style hood in heavy construction as a pipe welder in the field. I went with the 3M Speedglas based on reviews of others. I'm not sure what is so different, but I'm quite disappointed. The helmet flashed me a minimum of 10 times the first day I had it. I would expect this if I were in a tight location or awkward position leading to sensor alignment issues, but in was the sole welder in a shop. I'm a professional TIG welder and have had to completely change my style when using this helmet. Perhaps its due to the helmet having only 2 sensors; however, thought this a non issue due to welding environment and other reviews by TIG welders. Buyers beware. I wish I'd have stuck with Miller Brand as I've always had good luck with their products. Now I'm stuck with a $200 helmet I wouldn't sell to an enemy. Very unsatisfied with this purchase. ConsCheap headgear, poor fitment and function. All around unsatisfactory hood. Bravo speedglas you did it again. This helmet is fantastic, Works flawlessly great Optics very clear. Love the natural light color. ConsWish they had had a shade 13 setting. handy for carbon Arc gouging. But you only need this when your carbon Arc gouging at 300-400 amps and above. But in all fairness 99% of welders are not carbon Arc gouging at 400 amps. Great lightweight welding helmet with top class color and clarity plus it is compatible with fibre-metal quick-lok which my company makes us use. It doesn't have a side window option like my old 9000x or 9100xx but I personally don't need them and if you really want them you can pick up any 9000 series shell to put it in. It would be awesome if it had side windows, but other than that great hood for a great price. It is just like my 9002x that someone turned the lights on, and better head gear. I didn't want to spend close to $400 for a hood, and I waited just long enough that Speedglas figured that out and I got my 9002NC for about half the $ and I could not have made a better choice!! Excellent service and good hood. Light weight, very fast to darken, great product. This helmet is perfect for everyday welding. It is light weight and the optics is as advertised, I used for mig rig and robotic welding and works perfect. The best in its class .. size and weight excellent .. I used speedglas for more than 20 years .. but the 9002NC is at another level .. I recommend it 100%! The clarity is excellent and it is very light. You can't beat the bang for the buck. I recommend this welding helmet to everyone, you won't be disappointed. My "old" Miller Digital Elite has now been donated to a friend in need. This is a really nice upgrade to the 9002x, & 9002v. I had the 9002x with side windows, that I sold on eBay. I really love the fact that 3M changed the lens to natural color (like the 9100xxi), and the color of the silver face plate, which is now a charcoal grey instead of that bright silver. This is a no brainer guys/gals, plus Cyberweld has the best prices around. ProsA great helmet, now even greater with the natural colored lens. ConsIt's just missing the side window option, but they get scratched up anyways. Bought this hood about a week ago and it was on my doorstep 2 days later! Amazing service and in my opinion the best hood i have ever used even better than my buddies Lincoln Viking... You just have to remember to turn the on before welding which I'm still not used to. Really clear view before and during the weld i have no complaints so far!